A lot more goes into a jacket or sport coat, custom made just for you, than just measurements and figures. Knowledge of how the garment is made, how the tailors interpret your measurements, experience of how a garment should fit and how you should ultimately look and feel in the garment. That's why a Burdi jacket is something unique. You've got a family history of master tailors and their experience guiding you through the process. To us, it's not just another transaction, and we don't want it to be that way for you either. We want it to be an incredible, out-of-the-ordinary experience, something you'll long remember and to which you'll keep coming back. During your personalized consultation, we'll spend about an hour or so discussing what your needs and tastes are, what look you're going for and what fabrics you're interested in. We'll show you why our jackets are so unique. You'll see what a jacket should look like when someone spends over forty-seven hours cutting all the pieces by hand and sewing them together just for you. Once we've done that, we'll spend another thirty minutes or so fitting you, so that the jacket is uniquely yours. Below, you can learn a little more about just some of the things we'll look for and point out to you when you come in for your appointment. 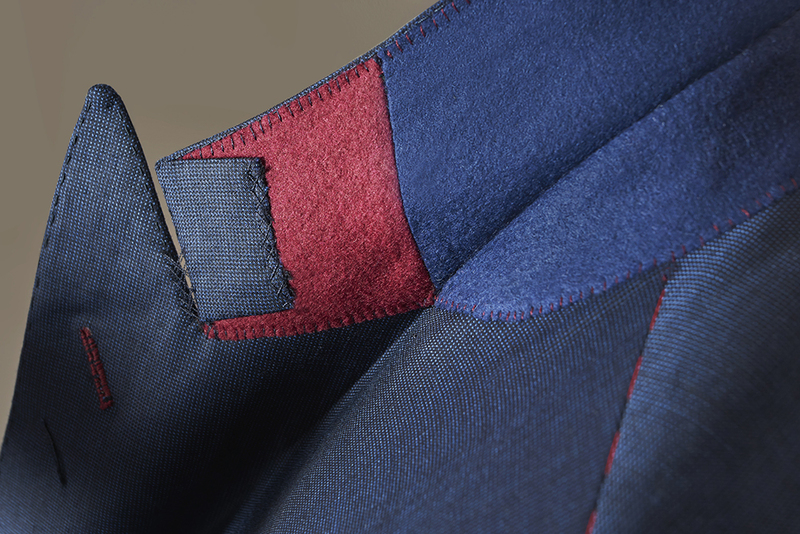 This is where you can spot a true sign of a custom garment - a hand sewn, pick-stitched lapel from 5mm to 7mm. If you pop the lapel, too, you'll notice that there are over one thousand hand stitches underneath, helping to give the lapel its shape. That's another fine detail you'll notice on our pieces, the beautiful roll of the lapel, how it falls from the break of the collar down to the buttons. Another true visible indicator of a handmade jacket, and coming into sharp contrast with the hard-pressed lines of an off-the-rack garment. 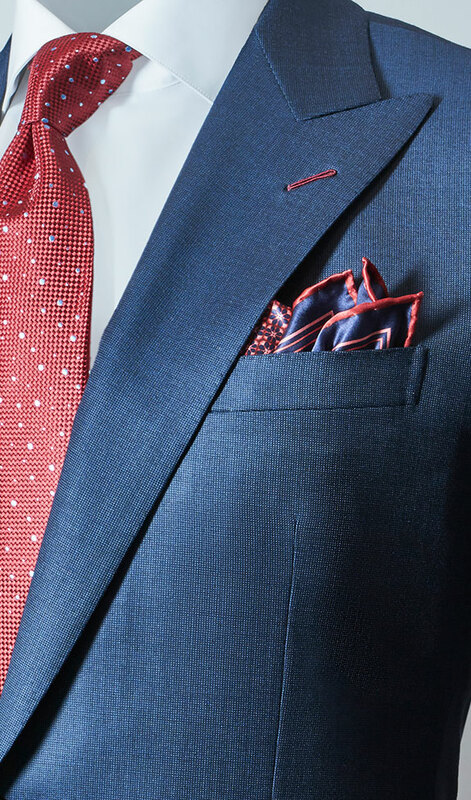 During your consultation, we'll discuss what kind of lapel will work best for you based on body type and personal tastes. 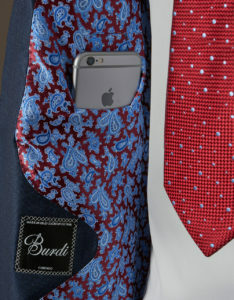 Would you prefer a peak lapel, a shawl or maybe a notch? We'll see where you'd like the top button to fall on you - what's called "the gorge", either higher up on your chest or down the belly. This is a particular piece of a custom jacket where the experience and knowledge of a master tailor really comes into play. To make the garment fit just right on you, we have to take into consideration far more than just how long is your arm. We look at the slope of your arm, how it hangs off your body. Do they pitch slightly forward or back? Does one hang a little more forward than the other, even by a centimeter or less? That's something that you'll never experience with an off-the-rack jacket. All of our suit and sport coats feature surgeon's cuffs. The buttonholes on these cuffs are hand-sewn with silk thread - an elegant touch. As for the buttons, you can choose how many and what material you'd like. One, three or four button configurations are all possible. As for the materials? Well, we offer various metal or horn buttons, but if you'd like something more exotic - we can make buttons out of mother-of-pearl, titanium or even 18 karat gold. The choice is yours. The shoulder is a vital part of a custom made suit coat or jacket. The drape of the fabric and the silhouette will set the tone for the entire garment and conveys a lot about you, the wearer, to those around you when you wear it. Even the size and location of the arm holes will transmit a message. Taking the shoulder expression into consideration means looking at how your shoulders and your body work together, and that's where our experience plays such a key role. Are you broad or narrow shouldered? Do you hunch forward when you stand straight, even a little? Do your shoulders slope a little, or maybe quite a bit? During your consultation and fitting, we'll help to determine what sort of shoulder would work best for you. Maybe yours is a more natural, unstructured shoulder, a Naples style. Or perhaps a more structured rollini will project the image you're going for with your custom piece. Our jackets sport a split collar, which is cut on a bias and detailed with hand-sewn contrast stitching. But the real opportunity to express yourself in under the collar. By default, we'll add a felt under-collar in a color that nicely compliments your choice of fabric. But, you can choose to customize the under-collar however you like - with a different color or a different material - suede, silk or even a luxuriant embroidery. The choice is yours! Our jackets can be lined with standard Bemberg, or satin. We offer all of our custom tie materials as lining options, and can even make you a custom tie that matches the lining of your new jacket. 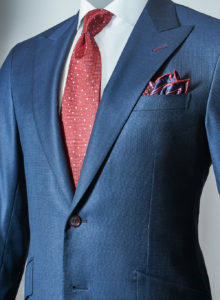 Your custom garment can sport three or four external pockets - two at the hip, one on the breast and, if you desire, an additional ticket pocket just above the hip. One of the final details you'll notice during your consultation are the half-moon stitches that finish the hip pockets - a real sign of a custom garment. And those hip pockets can be styled to your tastes and preferences, be it a flap, patch or hacking style pocket. All sport a "pocket in a pocket" detail - an additional internal pocket on the hip for coins and other small items. An additional detail of the breast pocket is a spot specifically meant to hold your sunglasses. No longer will you need to stuff them, and possibly damage them, inside an inner pocket or a briefcase. Have them always at the ready. 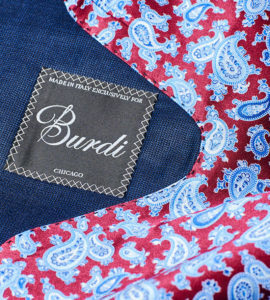 All Burdi sport and suit jackets come standard with five internal pockets, including specific pockets for your smartphone and a writing instrument. Each one can be custom fitted to your particular lifestyle and its needs. Maybe you need one a little wider or deeper for a cigar case, a particularly large wallet or some other everyday necessity - we can make that happen. All the pockets "float" inside the jacket. That way, if for some reason your jacket gets turned upside down, the contents of the pockets stay put. Too, by having a "floating" pocket in your jacket, you'll never experience the dreaded "pocket bulge" - your jacket will remain smooth and sleek on the outside. What's your body type? What sort of build do you have? Are you looking for a younger, more tapered look? Maybe you want something a bit wider? We'll take the answers to all those questions into consideration when we fit you for your new jacket. No one's body is perfectly flat - despite what you see in magazines and on TV- and a well-tailored jacket takes that into account. Stitching along the body helps guide the jacket to your specific contours and to elegantly flow with you as you wear it. No bunching, no cinching and no sagging. It fits just right, just for you. 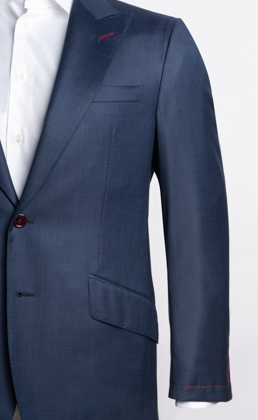 During your consultation you'll notice how light our jackets are when you wear them. We take camel hair, one of the lightest materials you can use for an interface in a jacket, and put it through a process called "sponging." That keeps it from bunching internally as the garment ages. We want this jacket to be something you'll wear for a long time, and we go to great lengths to keep it looking great. Around the back, you'll be able to opt for a central vent or two lateral vents, depending on your tastes and body type. We'll discuss the pros and cons of each with you during our conversation. Whatever you choose, you'll notice something unique to a Burdi jacket back there - a "vent keeper." It helps keep the vent closed down and neat, even when you've got the jacket buttoned up. No more looking like you've got a spoiler back there! Finally, we'll help you determine if you're going for a double-breasted, two or three button jacket. 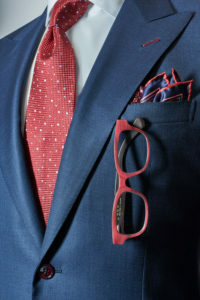 A really fine, elegant detail that speaks to the quality of a custom jacket are the buttonholes. Just like on the cuffs, the buttonholes on the body are hand-sewn with silk thread.